FREDERICKSTED, St Croix, USVI — Governor of the United States Virgin Islands (USVI) Kenneth E. Mapp was among governors who participated in a teleconference on Friday with President Donald Trump, Vice President Mike Pence, Acting Homeland Security Secretary Elaine Duke, and representatives of the National Response Coordination Center, Government House has announced. The subject was hurricane preparedness. The conference call provided the opportunity for the president, the DHS acting secretary, the administrator of the Federal Emergency Management Agency (FEMA), Rob Long, and officials at the National Hurricane Center to assure the governors of states and territories most likely to experience hurricanes that the required federal resources for a comprehensive response are in place. According to Government House, Mr. Trump praised the recent history of FEMA’s coordinated response with several states, including Florida and North Carolina, which continue recovering from major incidents. The governors, including Mr. Mapp, expressed their appreciation for the federal commitment to positioning resources and providing training in preparation for natural disasters. Governor Mapp, along with VI National Guard Adjutant General Deborah Howell and VITEMA Director Mona Barnes, thanked the president for leading the initiatives which are improving response coordination. “FEMA has done a lot to help the Virgin Islands and Puerto Rico to prepare for a hurricane,” Mt. Mapp said. He noted that the Viligant Guard exercise in May, which simulated a tsunami, was helpful in preparing responders and residents for a natural disaster. The territory’s leader used the opportunity to appeal to federal officials to remember that four million Americans live in the territories, and ought to be included fully in maps and other descriptions of areas under disaster threat, according to Government House. Mr. Mapp also extended invitations to Mr. Trump and Mr. Pence to visit the Virgin Islands. 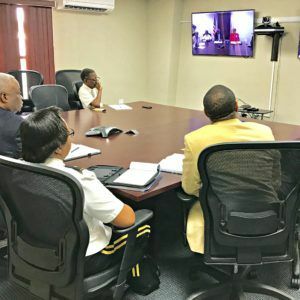 The governor, adjutant general and VITEMA director were able to participate in the teleconference from the offices of the Virgin Islands Bureau of Information Technology on St. Croix, according to Government House. They are all talk and no walk.